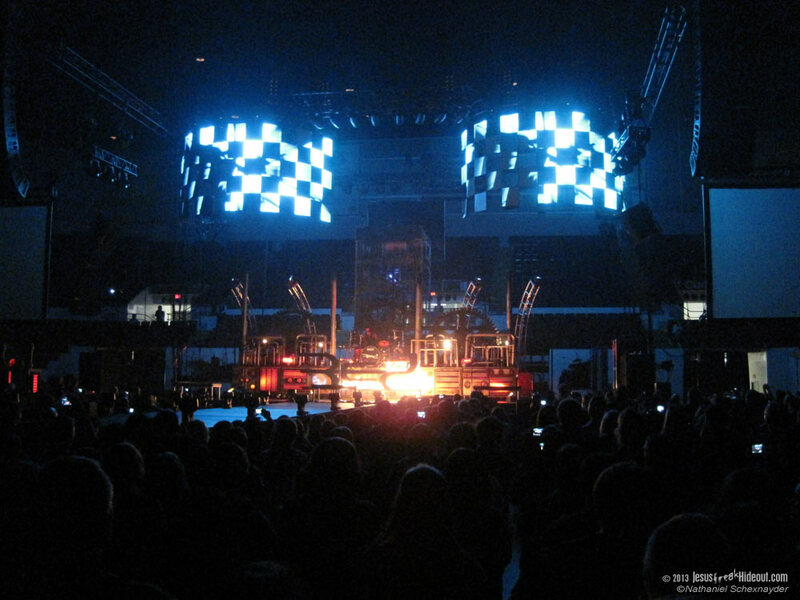 Winter Jam has been around since the mid-nineties, and it has reached the point where it's quite a juggernaut of artists on the tour. Last year, Skillet headlined and I was in attendance the year before when the Newsboys and the David Crowder*Band starred. 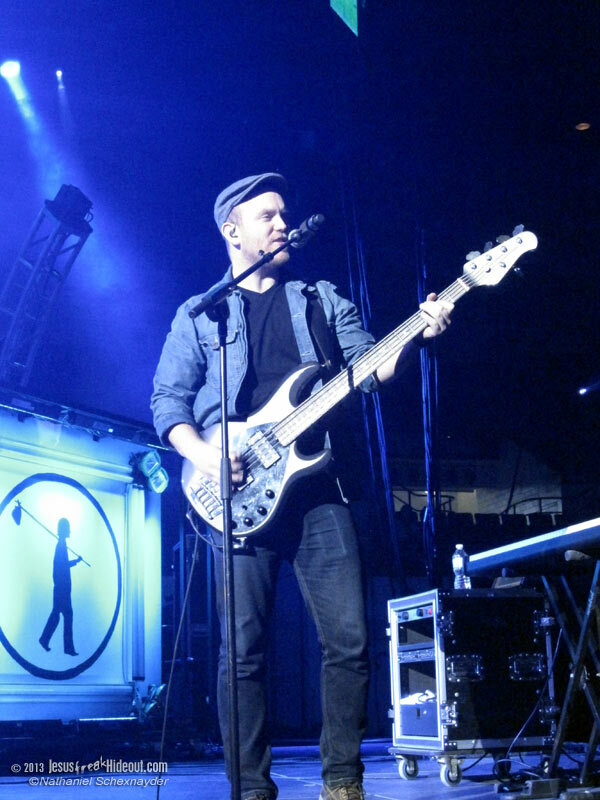 Now in 2013, seven new artists joined Red, Newsong, and Sidewalk Prophets from the show I witnessed two years ago. 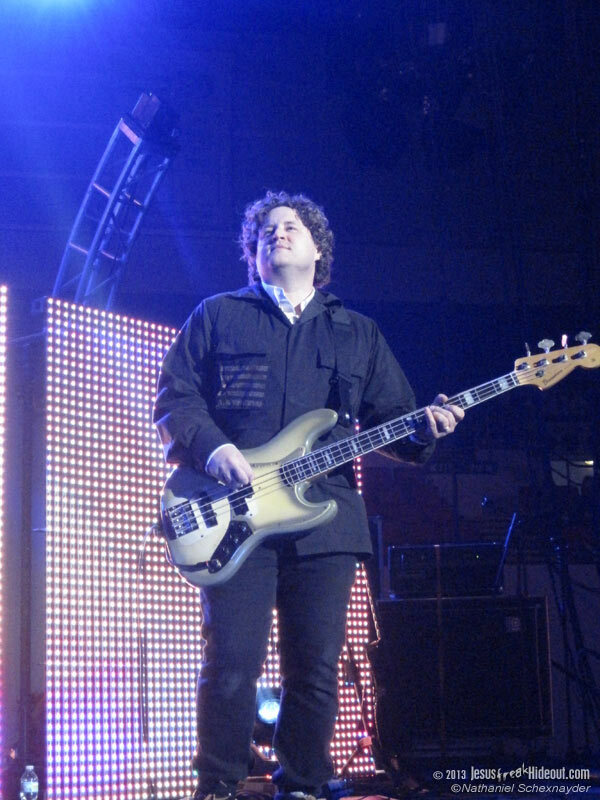 For those with Jam Nation passes, Russ Lee of Newsong began his chief hosting duties by introducing some of the artists for a session of Q&A. Some of Newsong, Sidewalk Prophets, a Red guitarist, and the entirety of OBB stood and took questions from the small gathering. The questions ranged from "who writes your songs?" to "do you get recognized on the street?" and "how did you get into Christian music?" When question time ended, the general crowd outside was allowed to trickle into the arena, and the music soon followed. 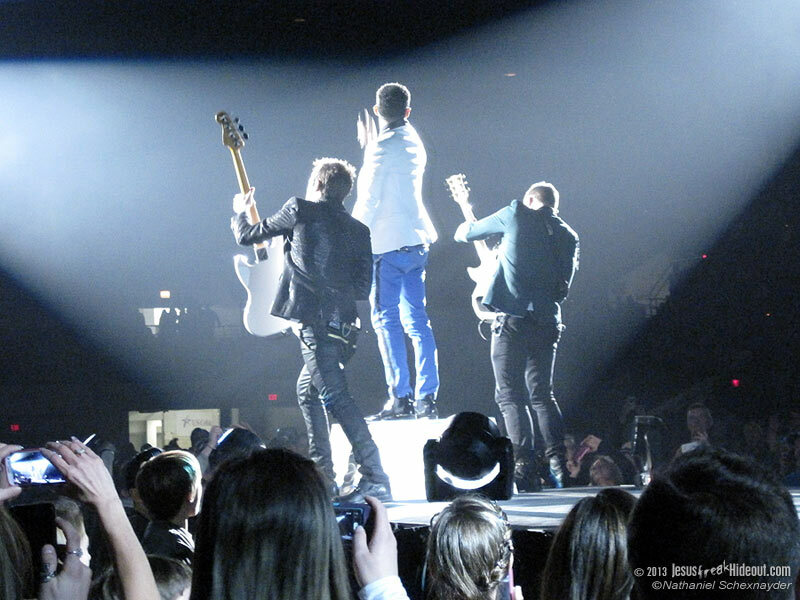 Capital Kings, a new duo recruited by Toby Mac and Gotee records, opened in the center of the arena. With their lead-off song, "I Feel So Alive," the early-bird crowd got into their high-energy, danceable music. 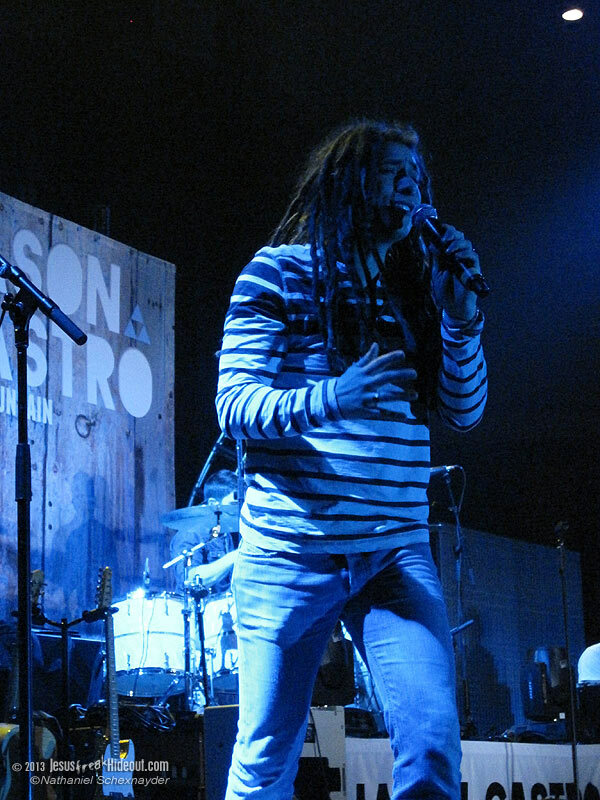 In the middle of Capital King's brief, electronically-charged set, they sang an introduction of their band before throwing t-shirts into the crowd. (I caught one while my back was turned and jotting down notes, so it's not as impossible to obtain something nifty as it may seen.) 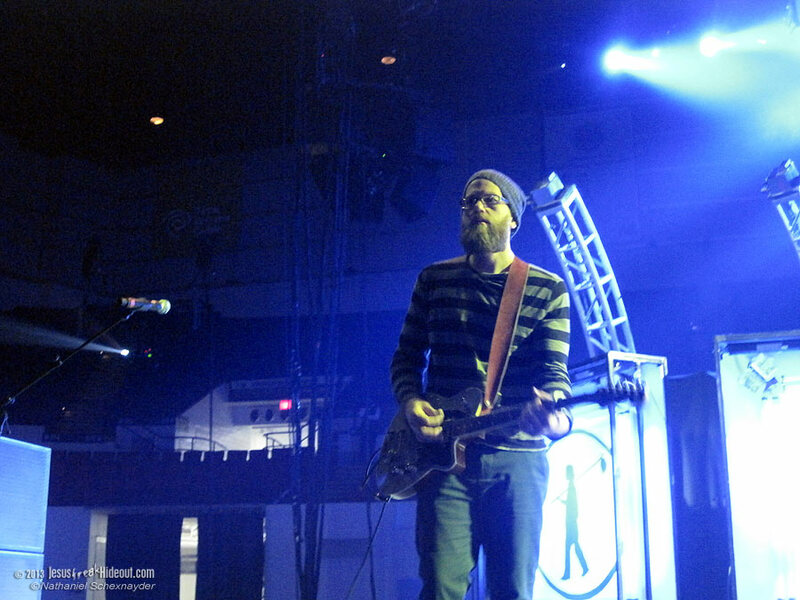 The band concluded their unfortunately short set with a brief cover of Chris Tomlin's "Our God" in their own style. 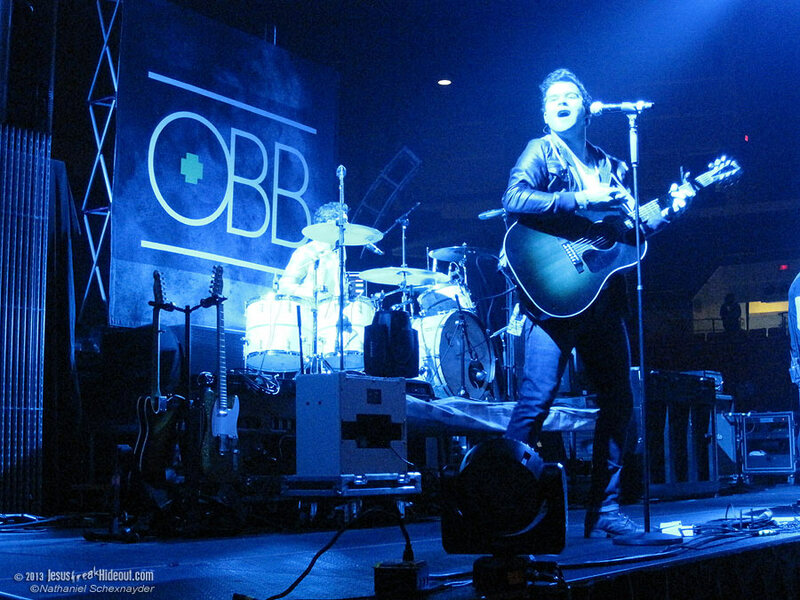 OBB, a trio of Oswald brothers from Atlanta, Georgia, took the main stage next. They just released an EP in January (ahead of a full-length later this year), and they preformed the first song off their EP, "All I Need Is You." 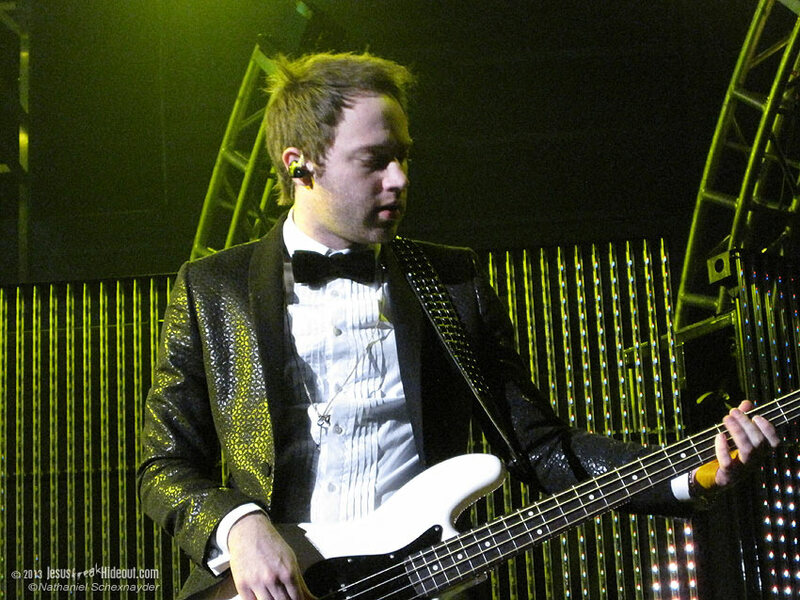 Their sound is best classified as generic, soft pop rock, and their final, upbeat song, "Wildfire," was the best of their selection. 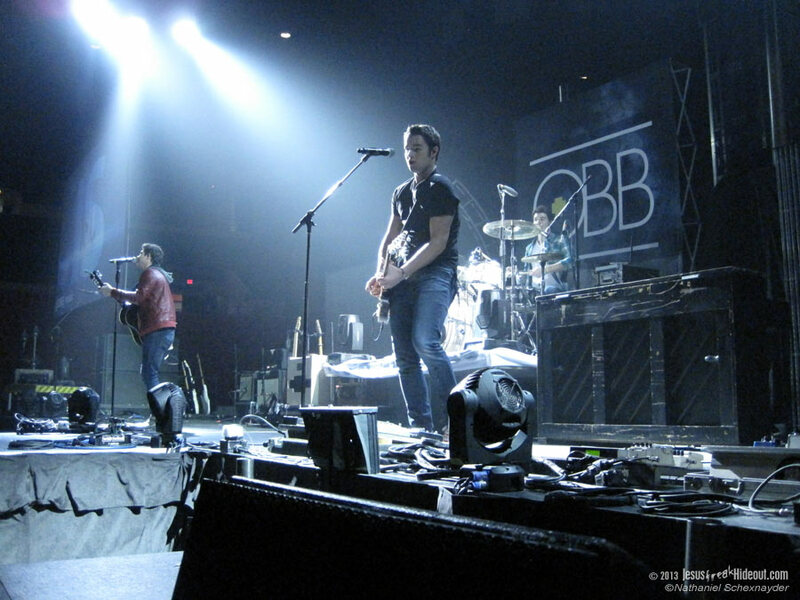 Amidst OBB's act, they performed "Come On Home," and they accompanied the song by reminding those in attendance that God didn't wait for us to get our lives straightened before He came to save us. 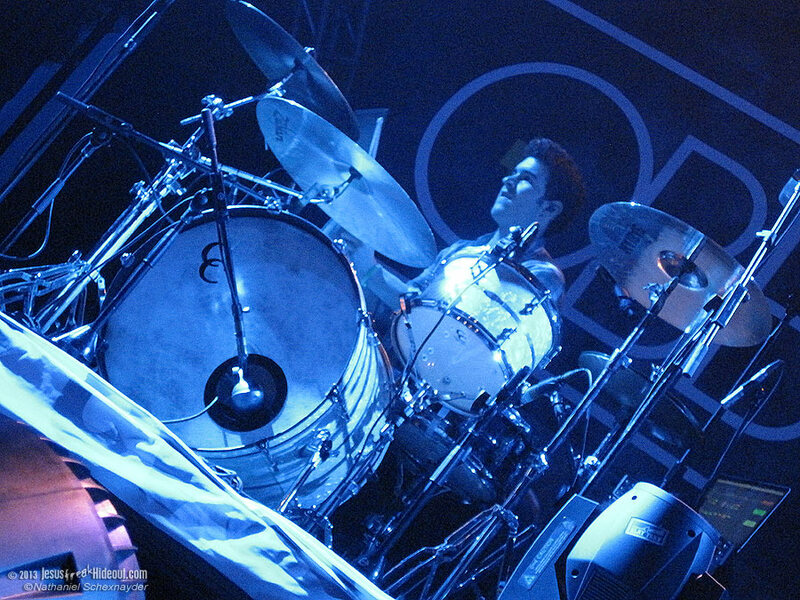 However, their music and set were overall a bit average, but this new band has a lot of time to refine their craft. 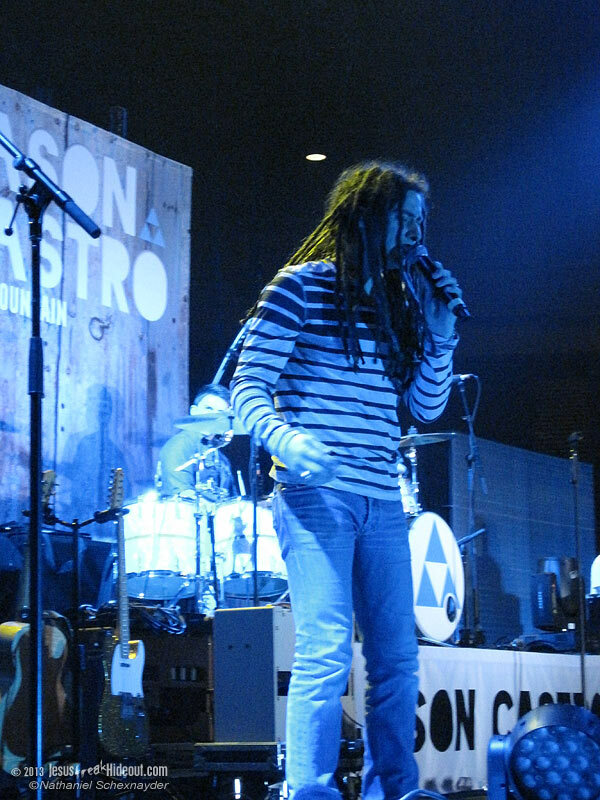 Even before the next artist officially took the stage, Jason Castro and his dreadlocks were easily identifiable. 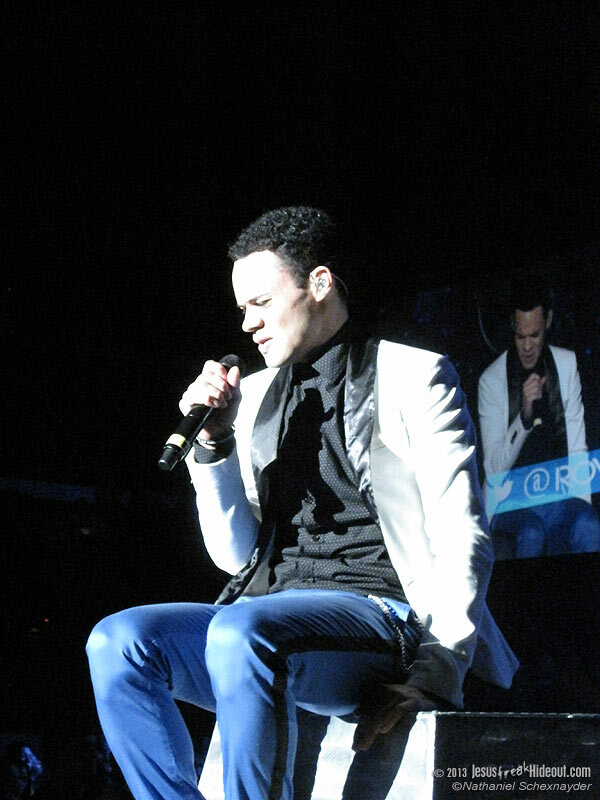 The former American Idol contestant received a warm welcome, and he kicked off his set with the contemporary pop song "Good Love." 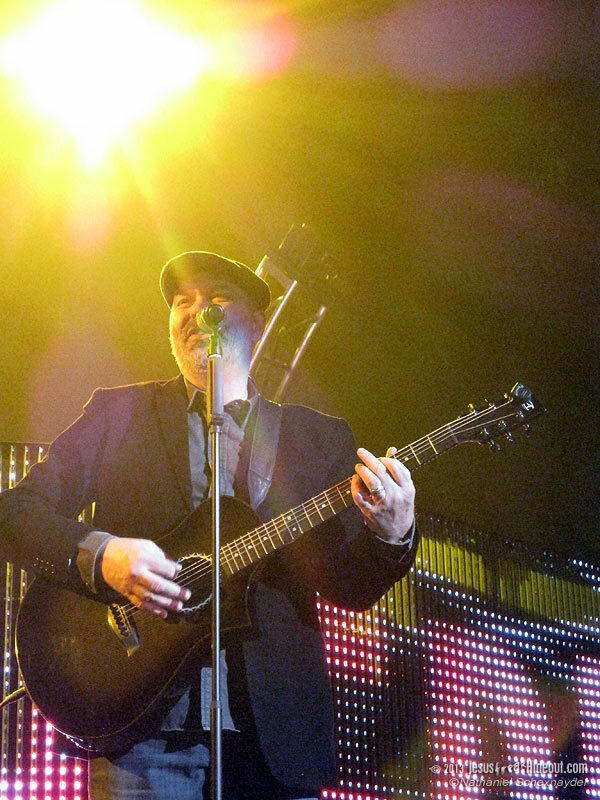 The title track off his new album, "Only A Mountain," was next, and "I Believe" followed. 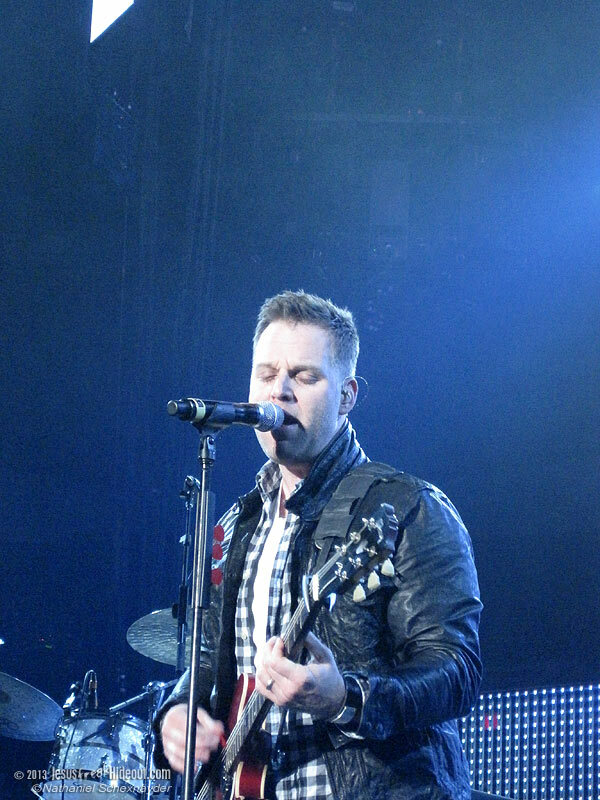 When the giant video screens above began broadcasting Royal Tailor's live performance, the night kicked off into full gear. 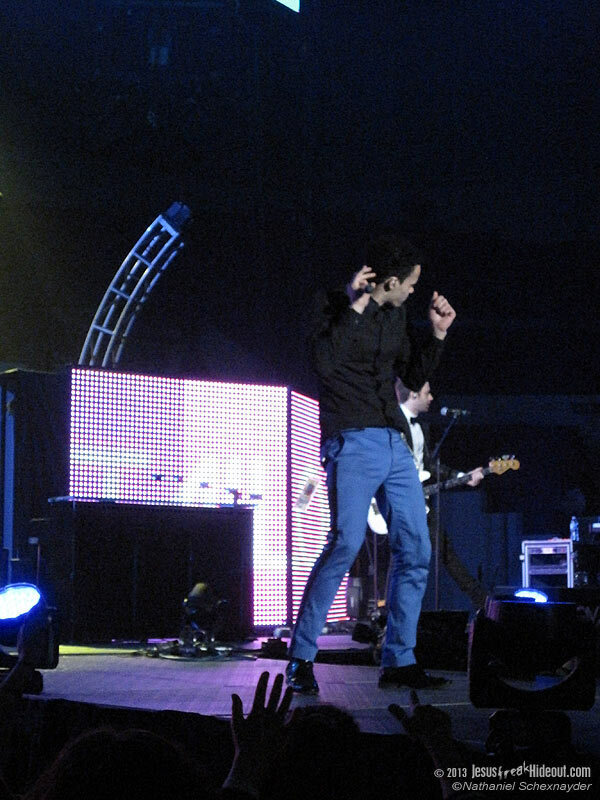 Now, Royal Tailor had a very high-energy performance filled with some dynamic acrobatics from the lead singer Tauren Wells. 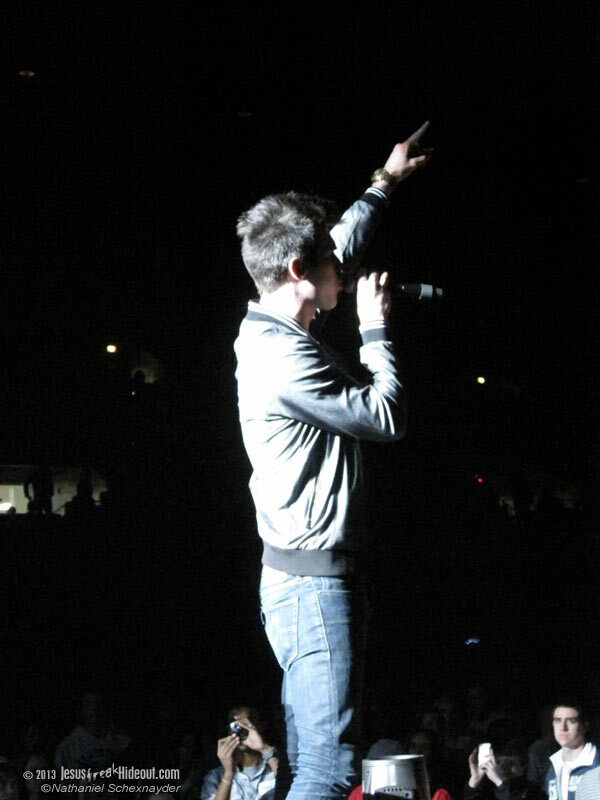 However, the sound was such that it was difficult to make out anything that he was singing. The funky pop rock song "Control" was easy enough to recognize, but I can only guess some of their set was new material. 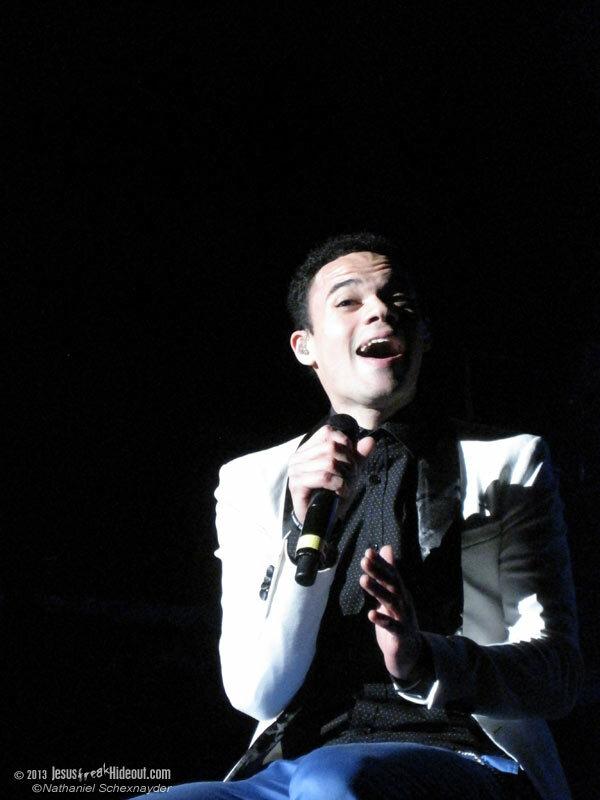 Wells' nearly acapella rendition of "Hold Me Together" was clear and emotionally evocative. The song accompanied his assurance that "Jesus will never leave you," and he had the crowd singing "nothing is impossible" with him. 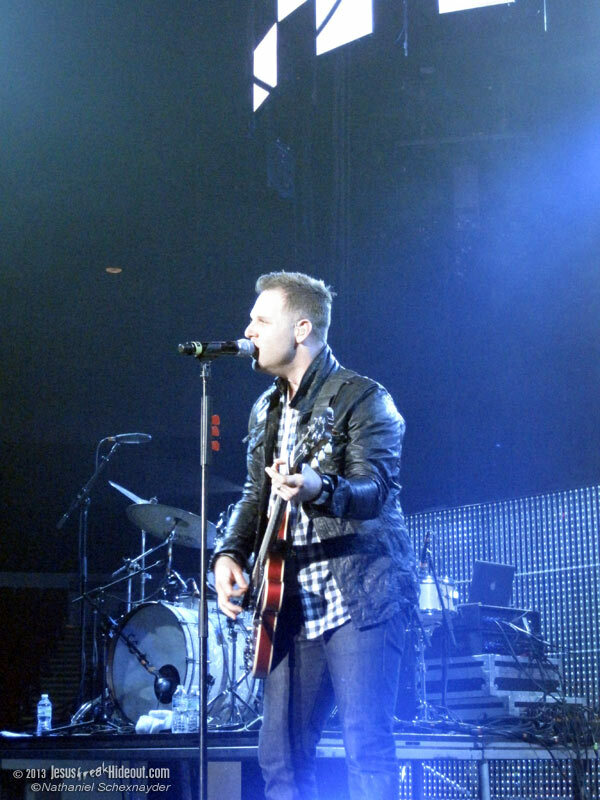 Royal Tailor concluded their set with this cry: "We love you Winter Jam! We love you Jesus!" 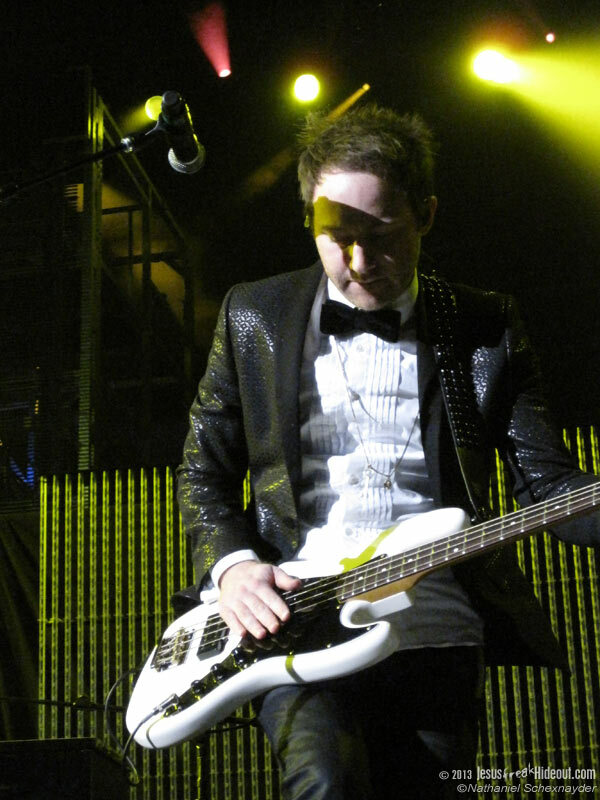 Newsong was up next, and their use of checkerboard lighting was a nice introduction. "Swallow The Ocean," the title track from their upcoming album, isn't a rock song to be sure, but it was upbeat enough for the crowd to get into it. 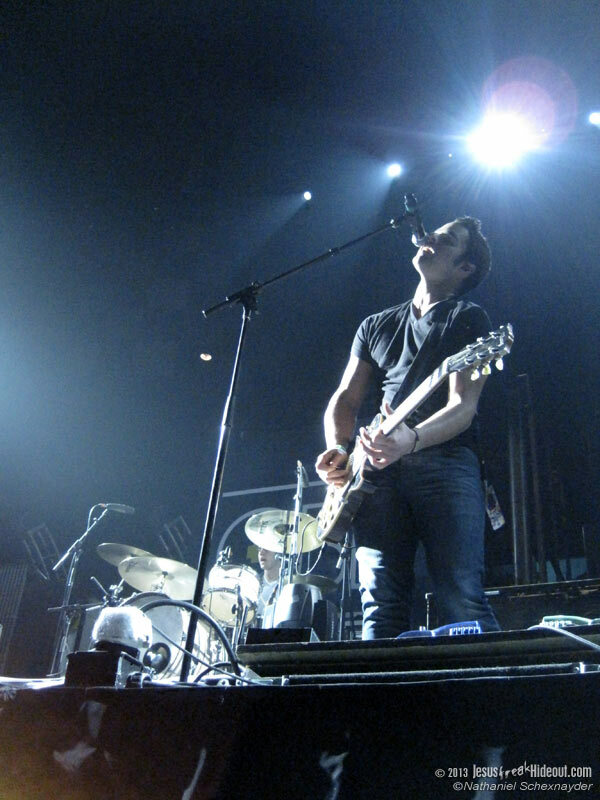 Throughout their set, the lighting was an important part of setting the atmosphere, and it was especially true with "Nothing But The Blood." 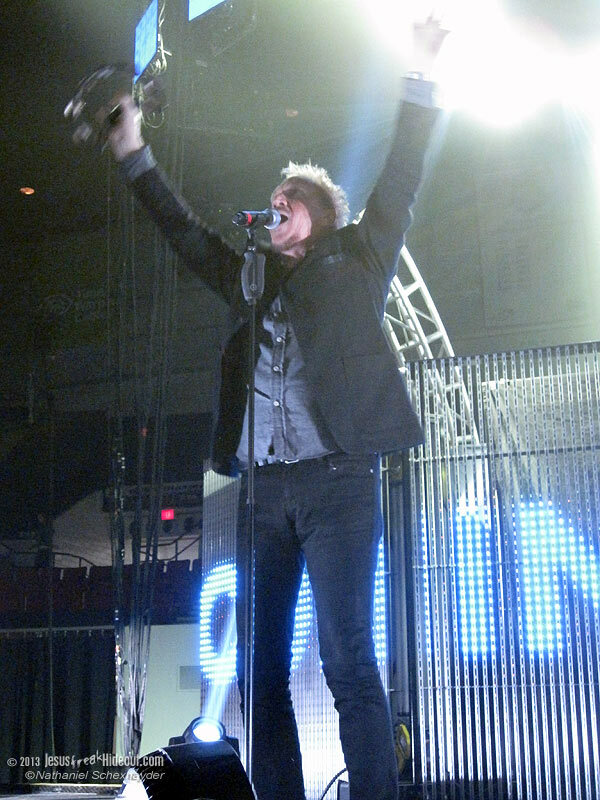 Newsong also covered "I Need You Jesus" and "One Thing Remains" ("Your Love Never Fails"), and, during their set, the microphone was passed between their vocalists quite a bit. 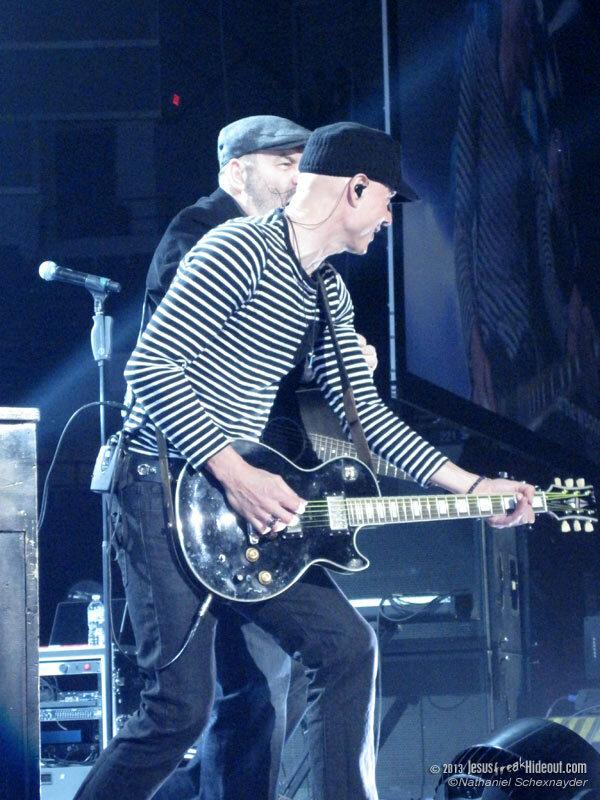 The band finished with their longtime, resurrection song hit "Arise My Love," and, although the song climaxes well, it was a bit long winded. 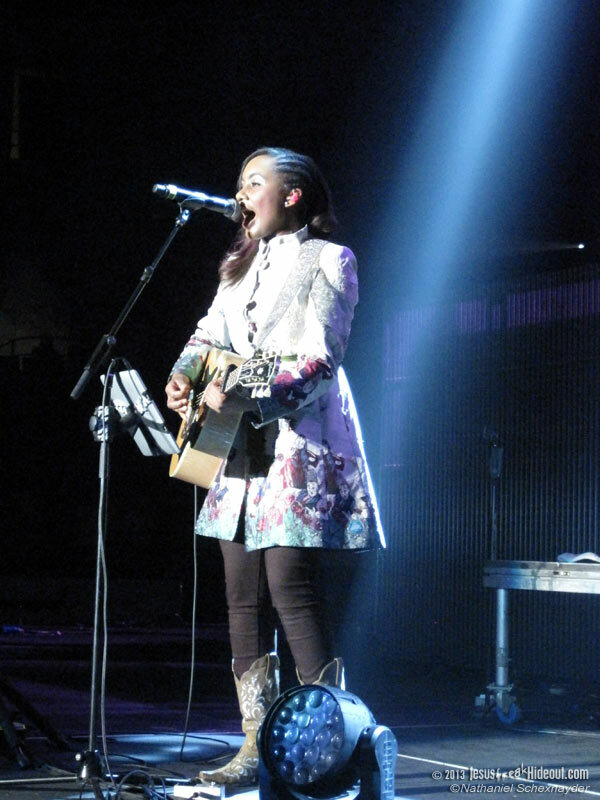 It took a moment to discover just where Jamie Grace was singing from at first, but she was walking from the back of the arena to the front while singing the poppy "Show Jesus." 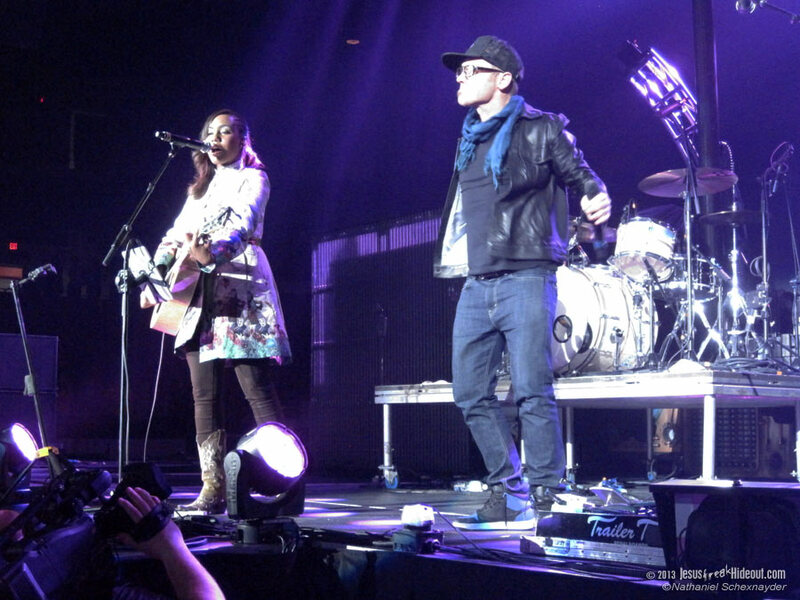 Her second song, "Lead Me" continued the upbeat mood, and she wove a rap especially crafted for the Winter Jam attendees into the track. The rap was a clever and welcomed change of pace. Instead of using her time to discuss herself and her music, Grace dedicated her next song to a young girl named Avery who was very sick. However, before she passed away, Avery expressed that being a "God Girl" gave her confidence. 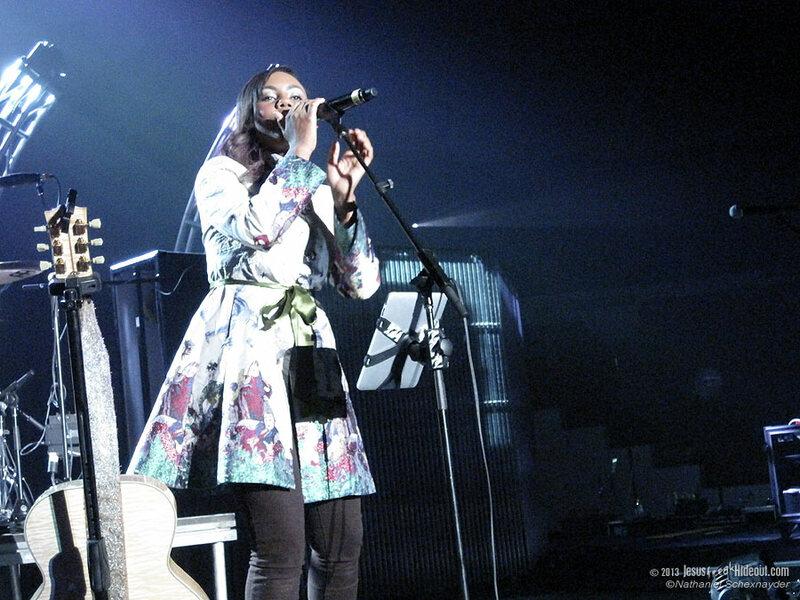 At the conclusion of her story, Grace played "God Girl," which began with an acoustic guitar. Not surprisingly, her last song was her mega hit "Hold Me" which, also not surprisingly, garnered a lot of audience applause. 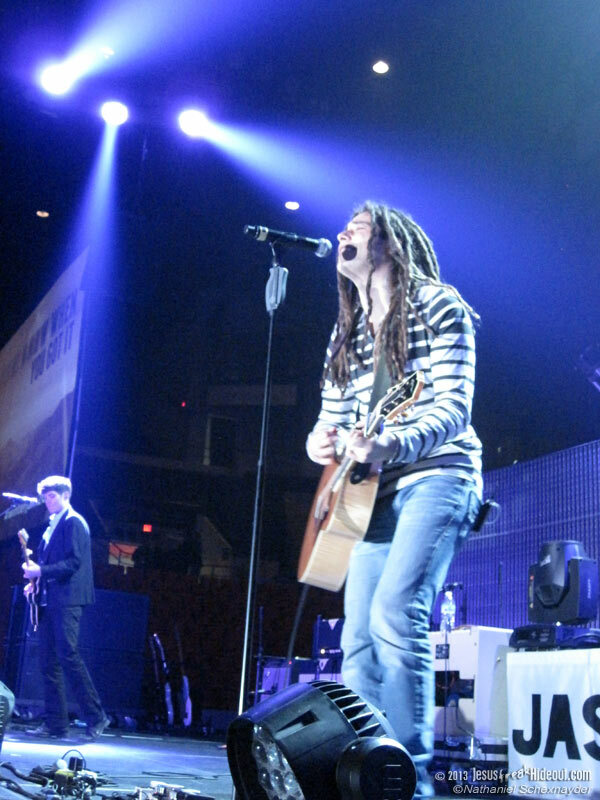 Equally as unsurprising, but nonetheless enjoyable, was Tobymac's appearance where he sang his bit in Jamie Grace's single. 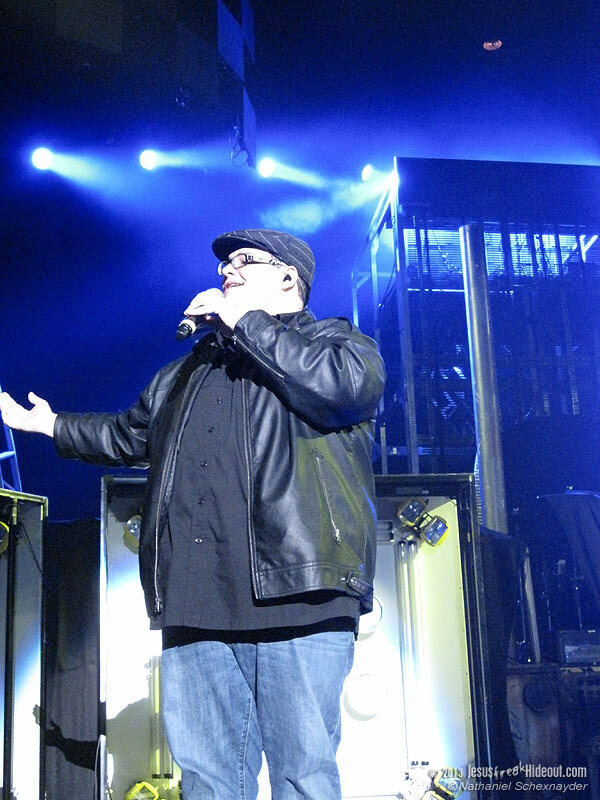 The night was still in full swing when Sidewalk Prophets took the stage, and they opened with the energetic "Nothing's Gonna Stop Us." 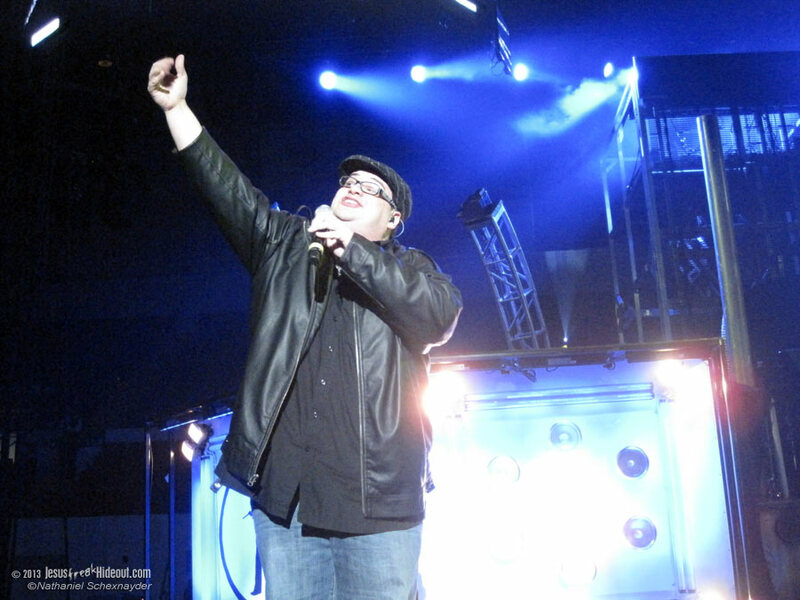 Two years ago when they were at Winter Jam, Sidewalk Prophets put a lot of emphasis on their single "The Words I Would Say," but, this year, "Live Like That" was more dominant of the two. In the middle of the set, David Frey read from Ephesians 2:10 and stated that the reason we are given gifts is to live a life of love. 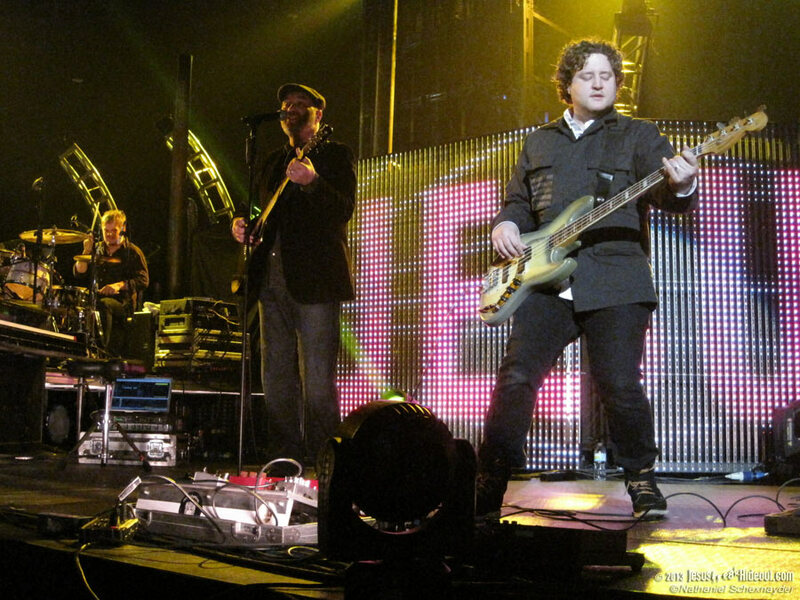 Since not every artist decided to flash their lyrics in front of the video stream, it was convenient that Sidewalk Prophets decided to highlight the words of their tunes in their set. The band claimed their final track, "Love Love Love," was a danceable tune, but I felt the song came a long way from fulfilling that promise. Nevertheless, the lyric video featuring LEGO creations acting out the song and a fun Chuck Norris joke thrown in for good measure. 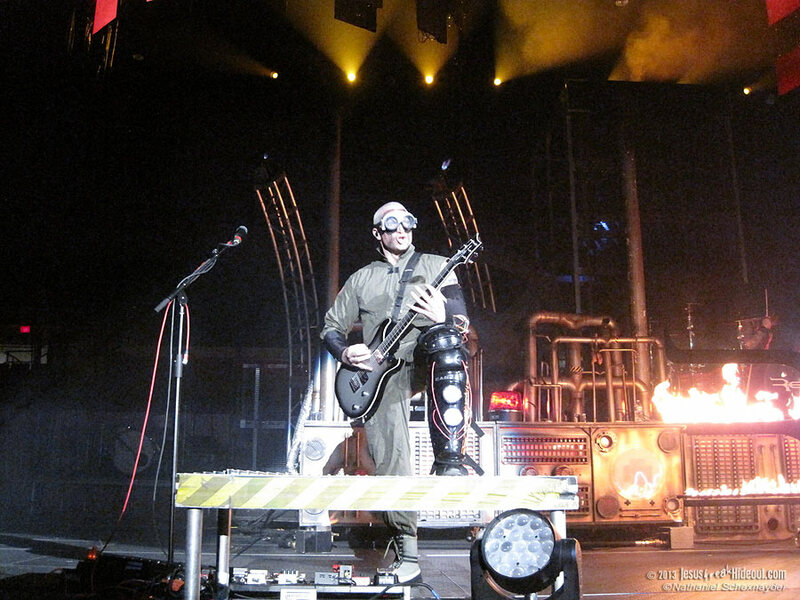 Now, even before the next band took the stage, the set which consisted of intricate machinery and giant gears (equipped with small flames over the top of it) strongly indicated Red was next. Sure enough, Mike Barnes, the lead singer, flipped a giant switch and the band started rocking with an impressive display of pyrotechnics in the background. 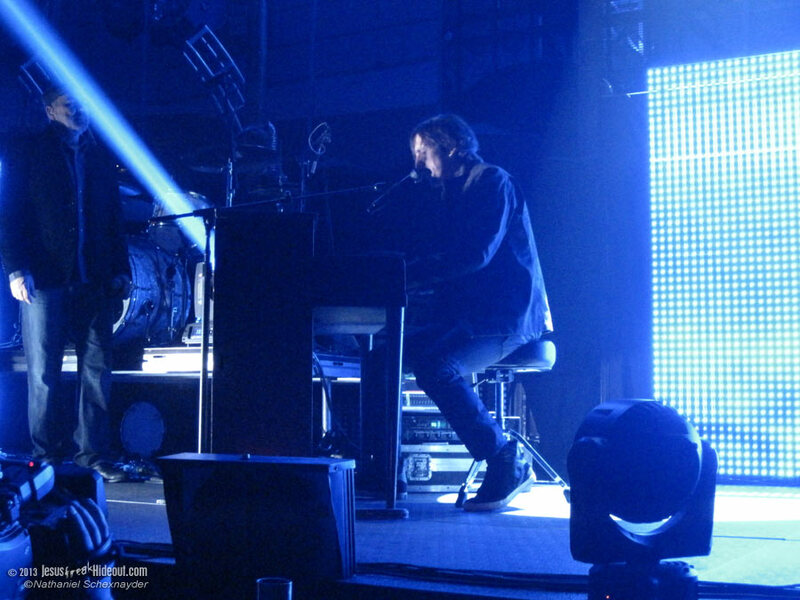 I'm pretty sure that one of the first two songs they played were new ones fresh off their album Release The Panic, and I think one of those songs was "Perfect Life" (but I'm not positive). 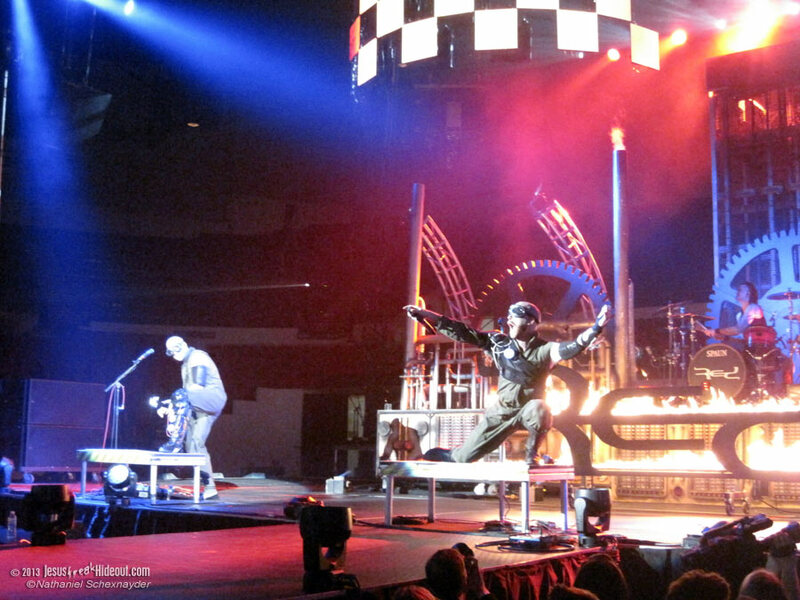 Red was almost impossible to understand the last time I saw them at Winter Jam, and their Milwaukee performance was no different (I wasn't the only one with that sentiment). If I didn't already know the words to "Death Of Me" and their last song, "Breathe Into Me," I wouldn't have gotten any lyrical content except for the slower "Not Alone." 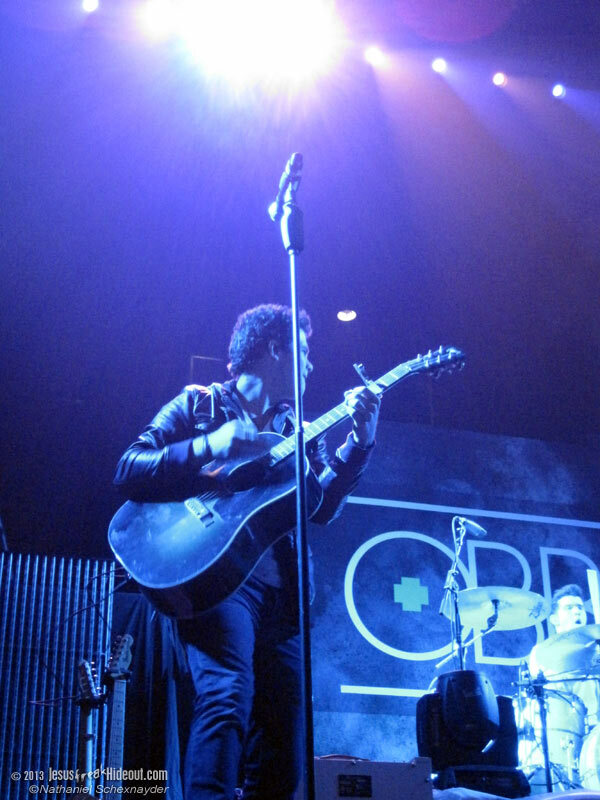 Anyone going to upcoming shows should listen to Red's new CD several times to get the most out of their live performance. Speaking of their new album, Red played the title track of their brand new album, and they sold a limited number of unreleased albums for $5.00. 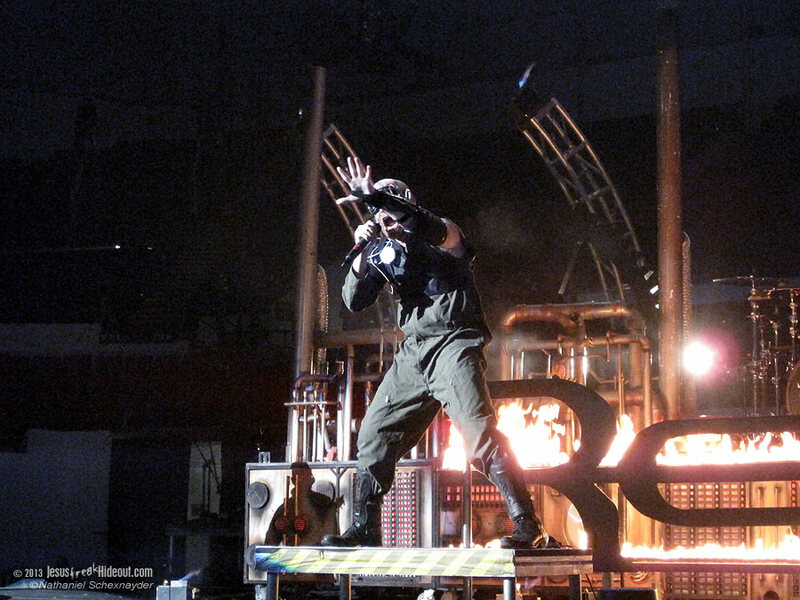 If you can get past the audio issues, Red had an enjoyable set (including the most creative) thanks to their innovative outfits, background set, and pyrotechnics which included fireballs, sparks and more. 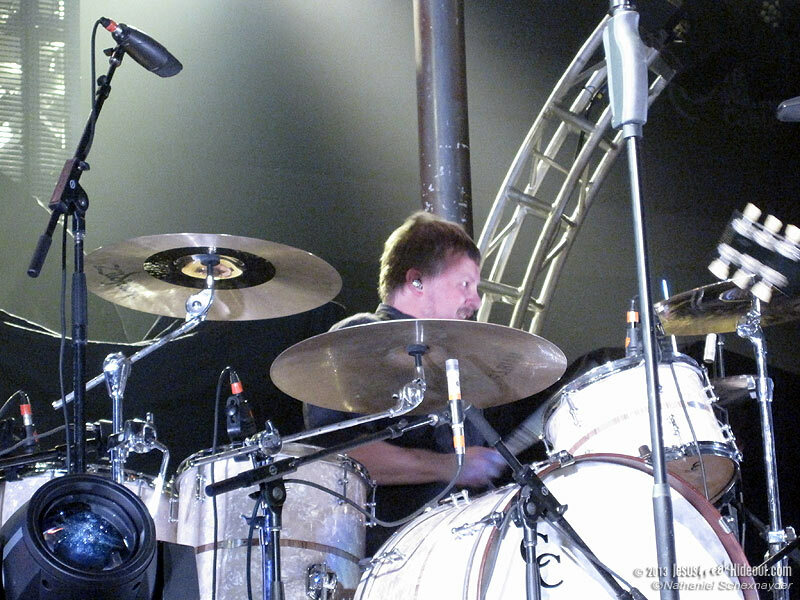 When the band had an opportunity to share a word of encouragement, Barnes said "God loves you and is with you." There were two reoccurring topics that night. First, everyone cracked jokes about the cold weather in Milwaukee. Yes, it was snowing outside, but, in all fairness, it had warmed up to ten degrees outside. Second, many speakers in between acts promoted World Vision. Multiple videos were played about the impact one person can have on a family's life and about the great need to help the impoverished children in the world. When scripture was quoted, it was from James 1:27, Proverbs 19:17, and Matthew 25. After Red's set, there was the fifteen-minute intermission where many young people bolted from their seats to get ahold of the new Red project. 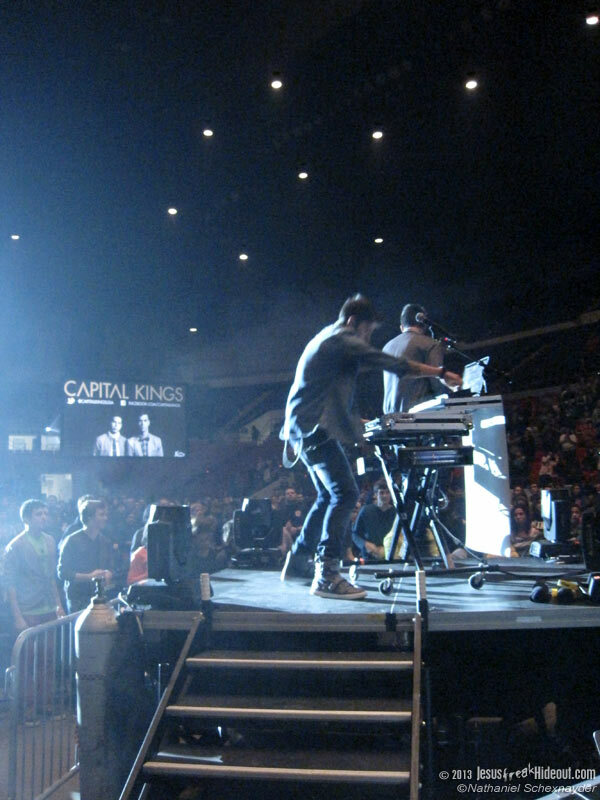 Kicking off the music again was the return of Capital Kings and their energizing electronic beats that lit up the place before the next artist. 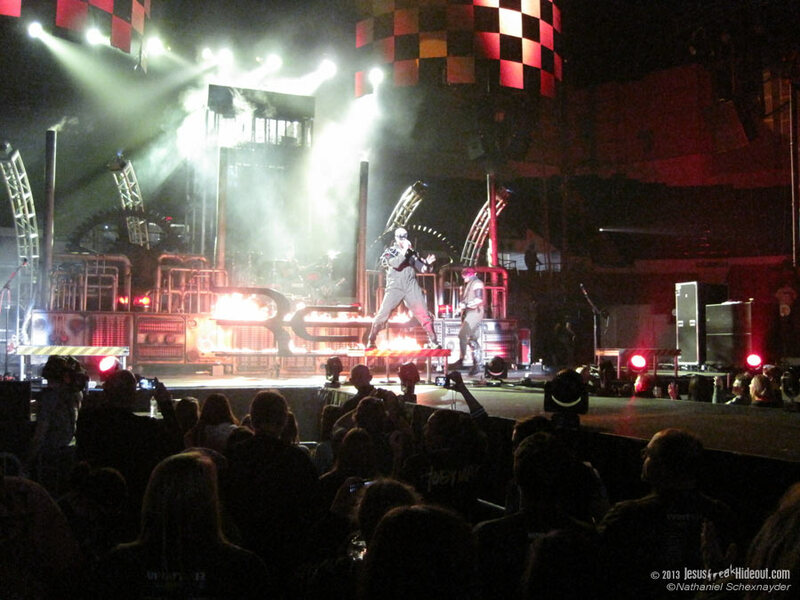 After Capital Kings' brief appearance ended, the opening vocals of "The Motions" immediately resounded throughout the building. 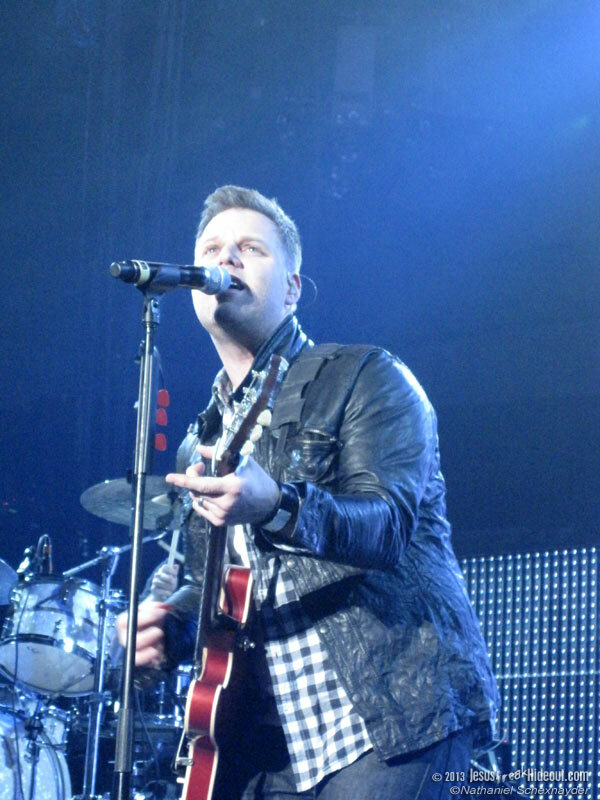 The response to Matthew West and his single was strong and continued with his older, popular single, "More." At the next point, West decided to "make up" a song on the spot, and the response was mixed. 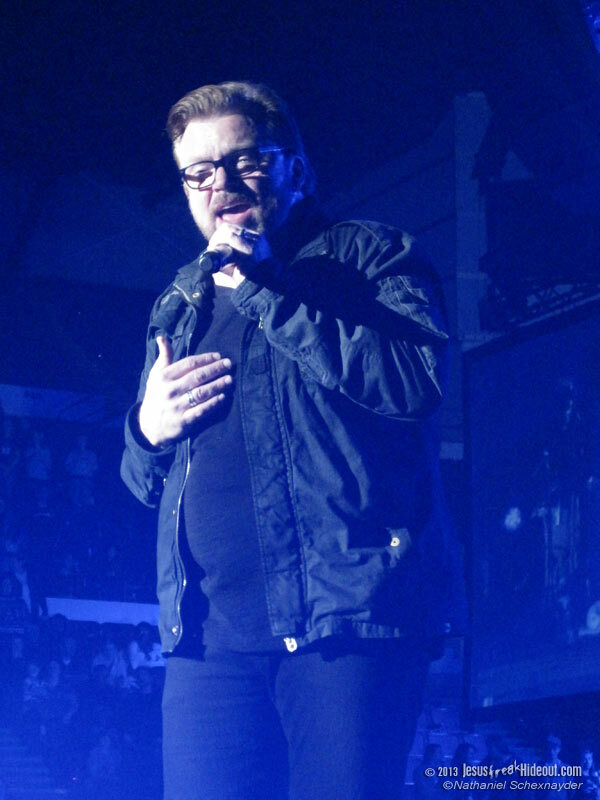 The song, which was about peeing in one's pants at Winter Jam, was well received as good humor by some, but others (including myself) thought the song was a bit tasteless and uninspired. 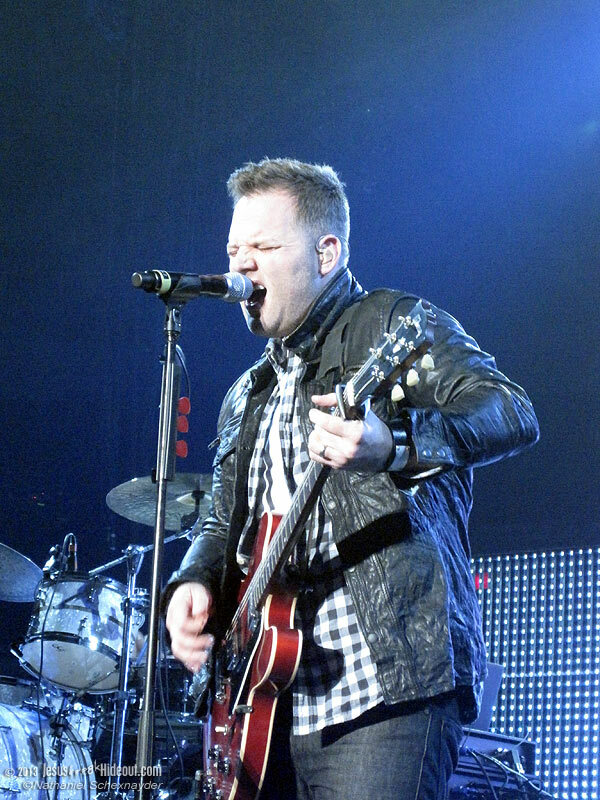 Nevertheless, Matthew West quickly recovered and talked about his effort to get stories from his fans integrated them into his album. 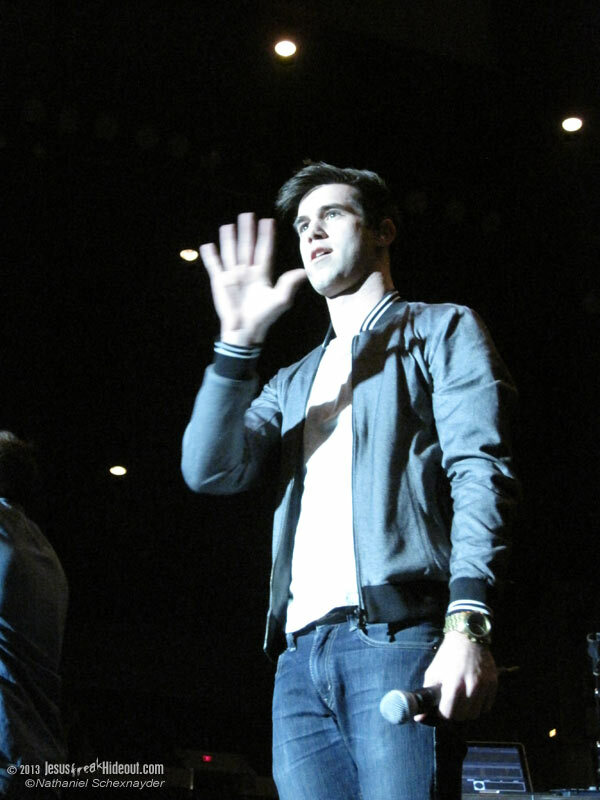 The first, "Hello, My Name Is," went over well as a pop song and an emotional tale describing the victory of a young man's struggle with drugs. The second was a powerful story of forgiveness about a mother who lost her daughter at the hands of a drunk driver. 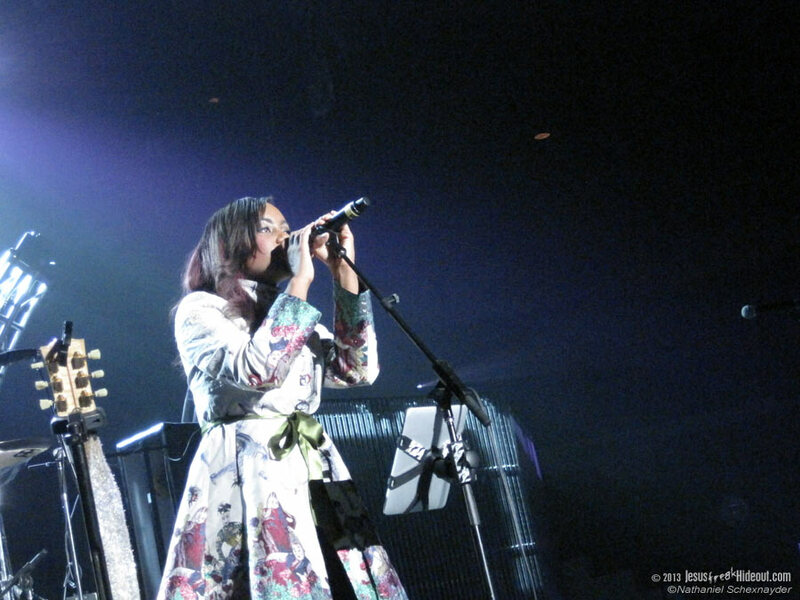 The ballad "Forgiveness" was inspired by her willingness to set aside her bitterness and offer forgiveness to that man. 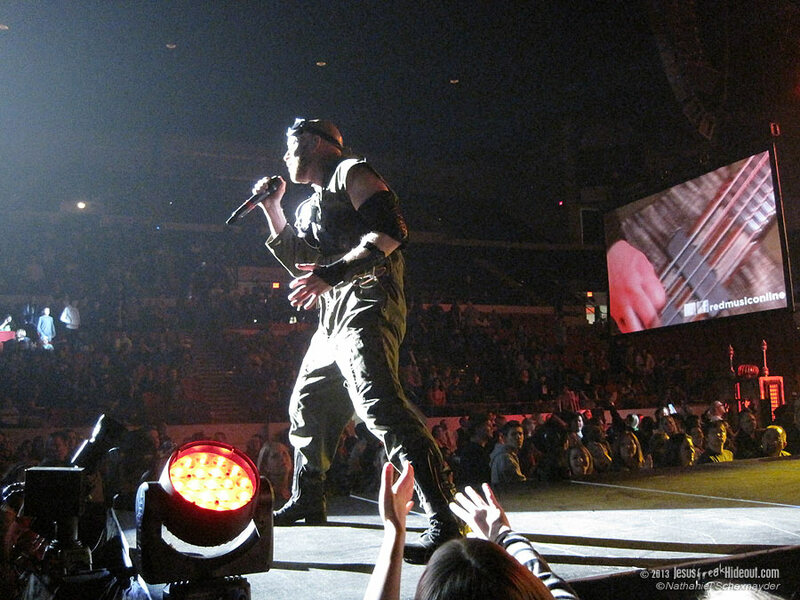 West closed his set with "Stronger" and encouraged the audience again to hit the reset button. 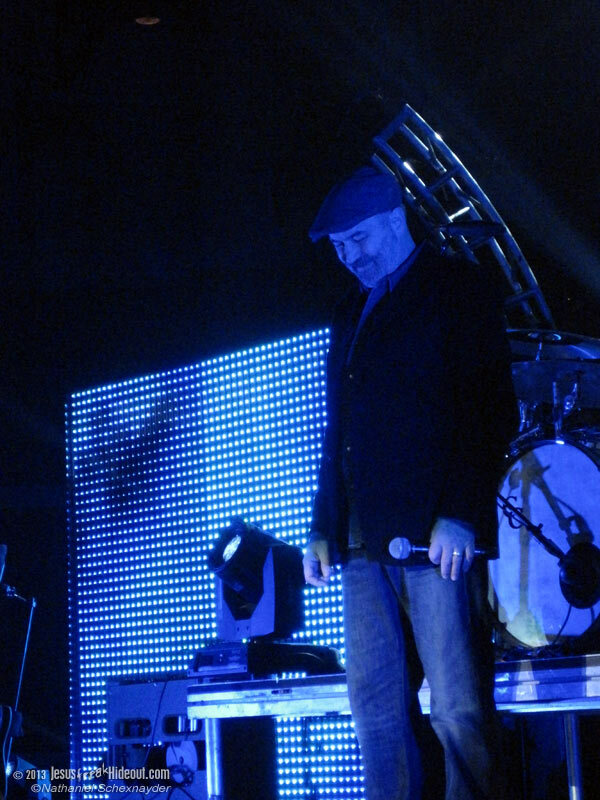 Russ Lee came back for his final address to the folks attending Winter Jam. 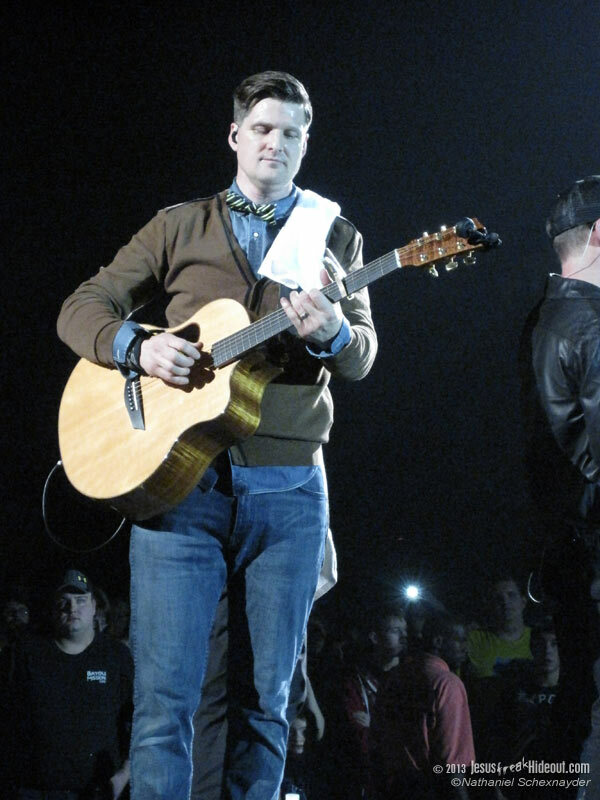 Before a crowd of 7,000, Lee mentioned the raw numbers for their entourage was something like ten vans, four trucks, and 140 people, and he asked for prayer for safety for the rest of their tour. 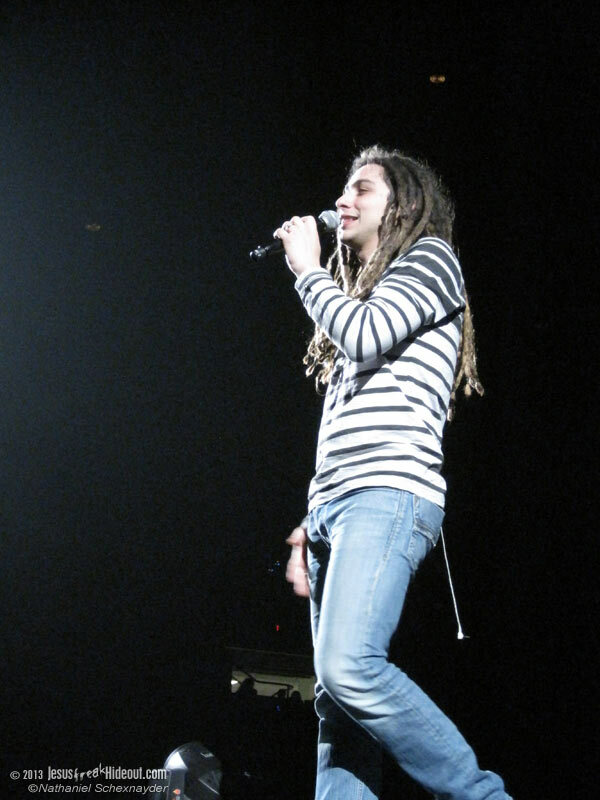 For the freewill offering, Jason Castro, armed with an acoustic guitar, sang an emotionally stirring "Hallelujah" from his first album. 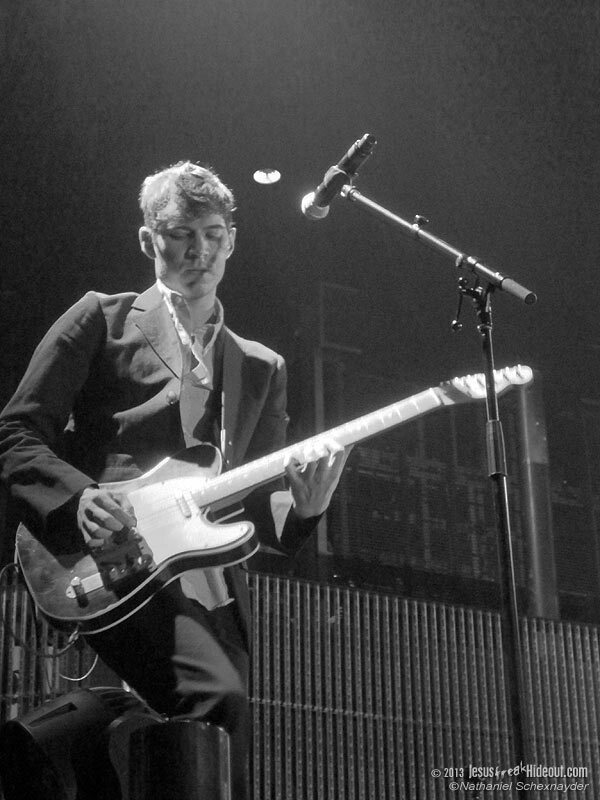 In the darkened arena, the show was finally ready for its headliner. 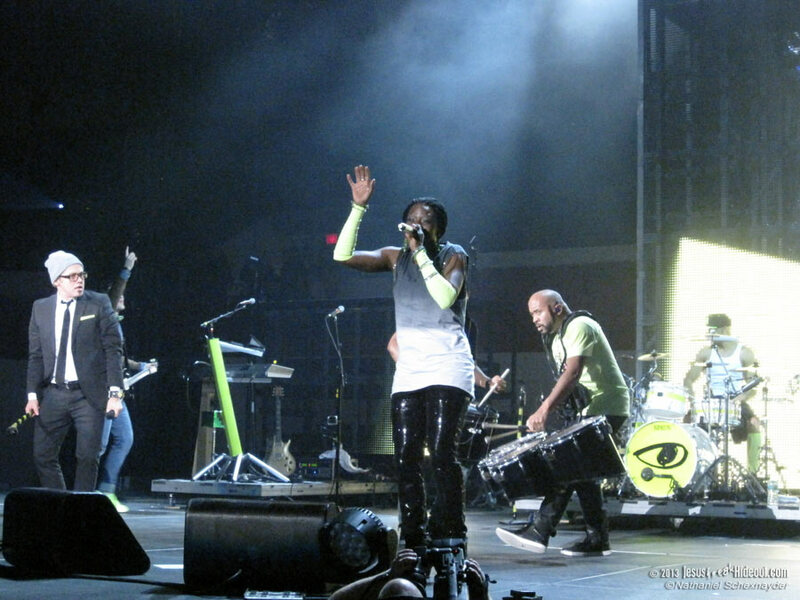 Then the superb "Made To Love" kicked in and TobyMac and the eight members of Diverse City appeared. 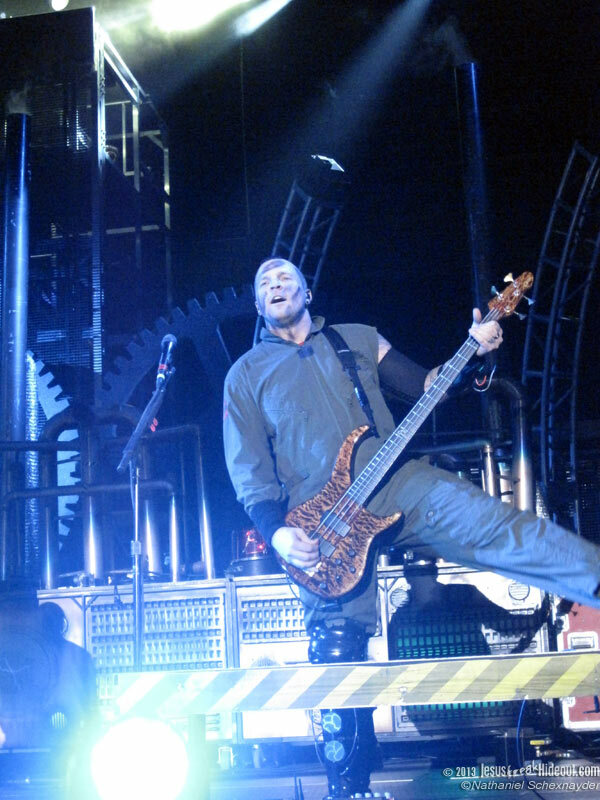 He commanded incredible stage presence, and there was great energy onstage. DJ Maj, who debuted on top of the Eye On It tower, led the way into a terrific rendition of "No Ordinary Love." 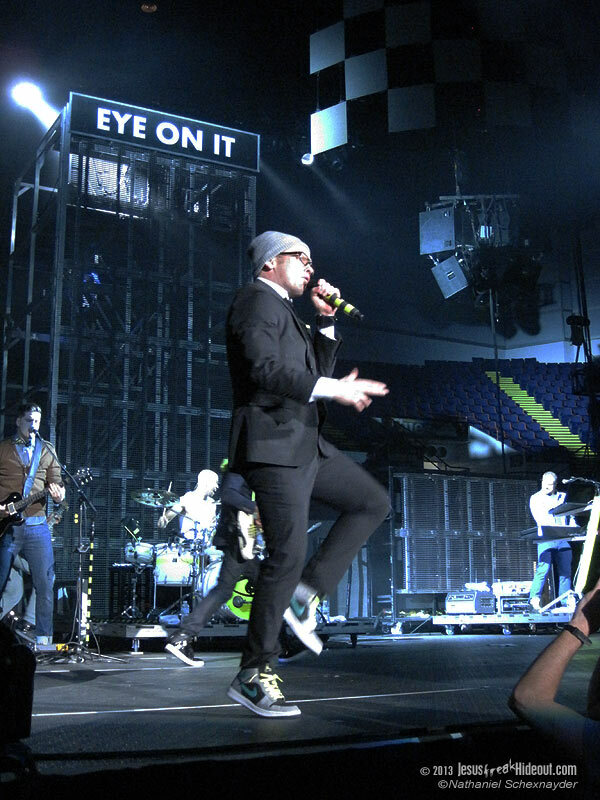 About the time the title track of Tonight was played, TobyMac and Diverse City were running all around the stage and, in some cases, into each other (purposefully, that is). 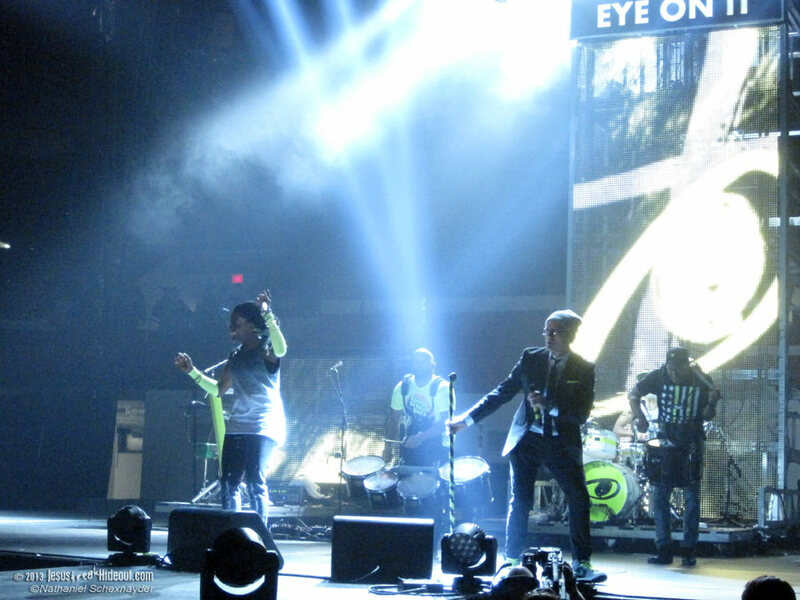 TobyMac said that one of his goals was to get everyone under the roof sweaty, and he certainly succeeded onstage. 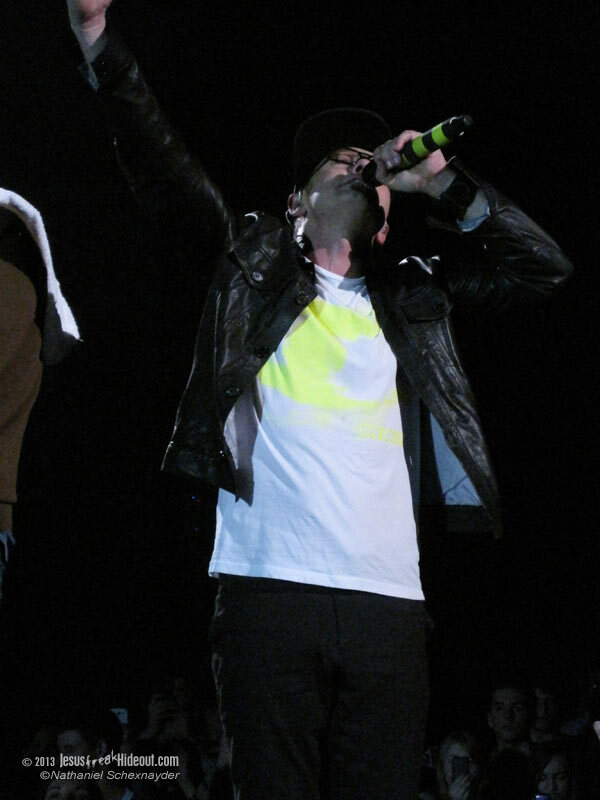 In the middle of his performance, TobyMac changed clothes and sneaked onto the floor. Then several of his tracks were sadly cut short a verse or two, including "Lose My Soul," "One World," and a truly booming "Boomin.'" However, the greatest injustice occurred when "Gone," which was dedicated the ladies, didn't get the full treatment. 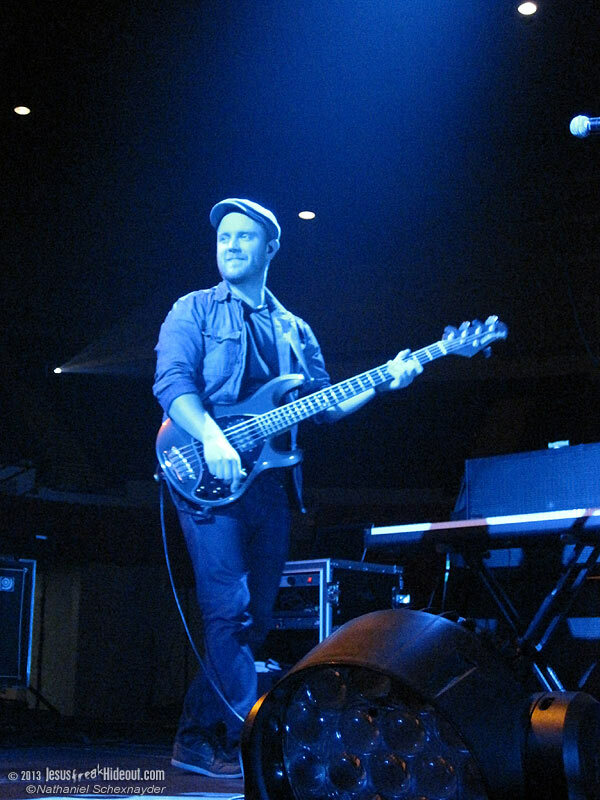 The end result was more music though, and he managed to squeeze "Steal My Show," "City On Our Knees," and Matt Redman's "10,000 Reasons (Bless The Lord)" into the show. 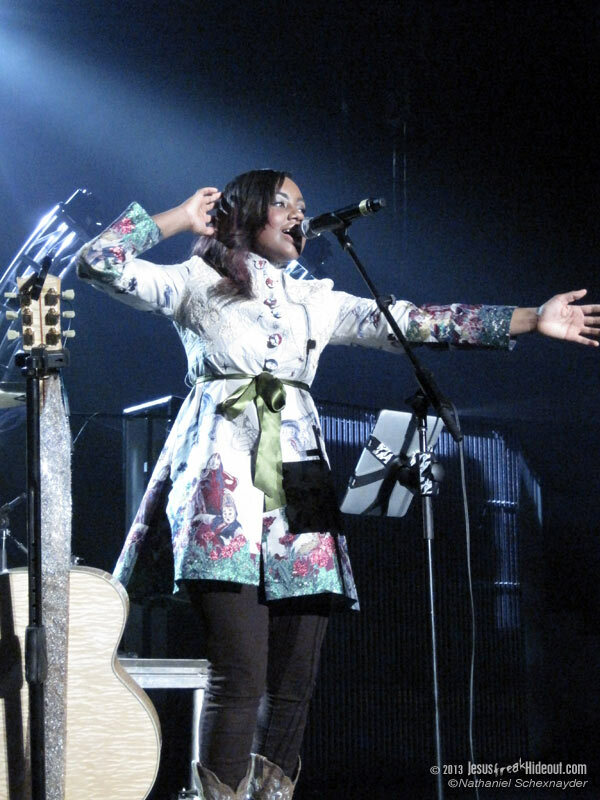 "Get Back Up" featured Jamie Grace's vocals on the bridge, and "Funky Jesus Music" contained a video montage of many CCM artists, including Michael W. Smith, Skillet, Stephanie Smith, Amy Grant, Third Day, and David Crowder. 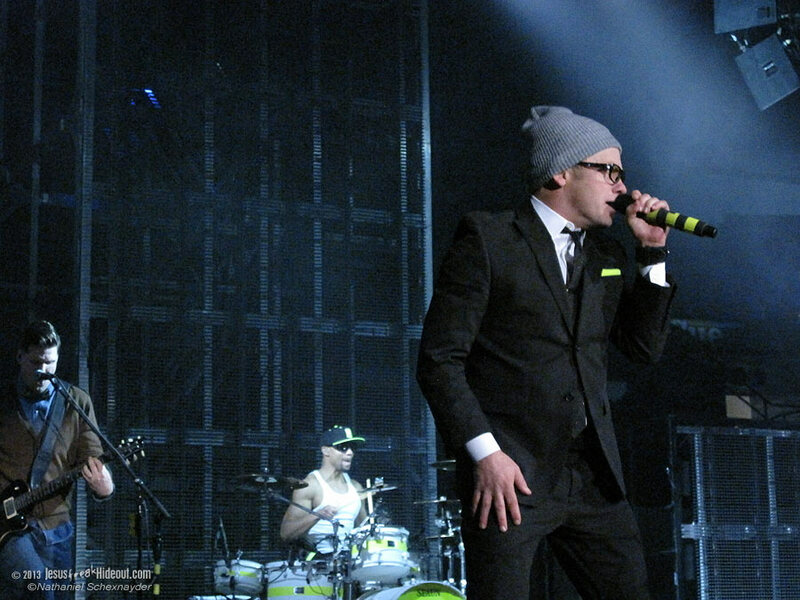 TobyMac prefaced Lecrae's guest vocals on "Forgiveness" by explaining that some fans were expecting a dirty southern rap from the popular rapper. 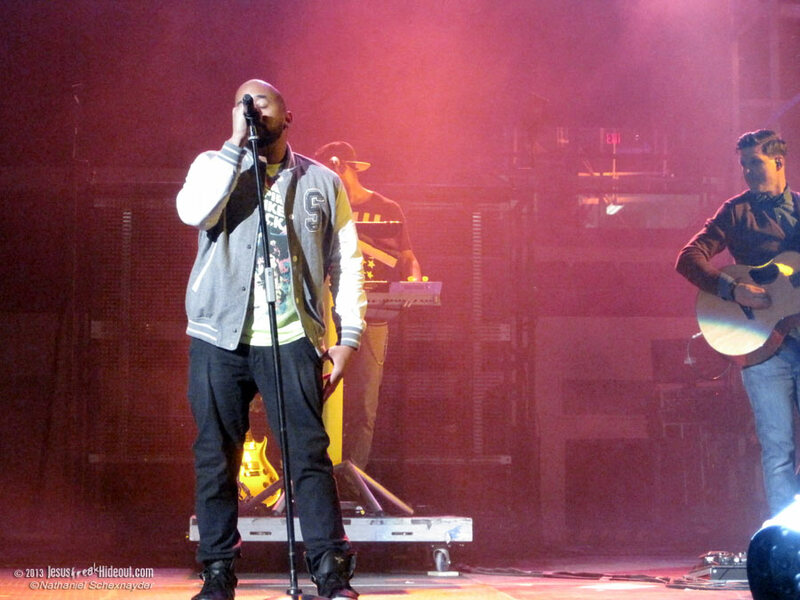 But TobyMac said that it was unnecessary, and that it was more important Lecrae had a heart of forgiveness. 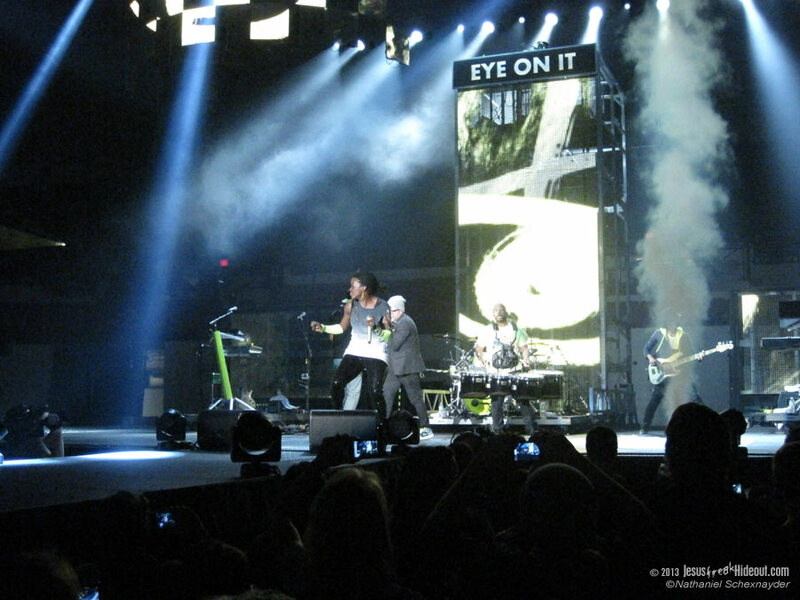 During "Forgiveness," Lecrae sang his bit from a video screen back on the stage. 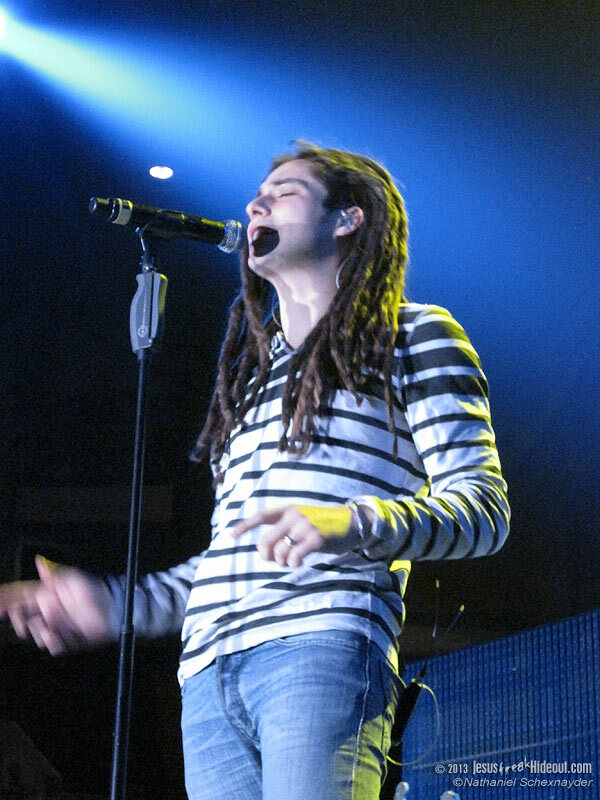 When the song was finished, Toby said that the theme of the night was forgiveness, and he hoped that the crowd would go home and offer forgiveness (and an apology if necessary) as we should. The night concluded with the "Me Without You," where everyone who preformed earlier along with some Winter Jam youngsters took the stage. When "Me Without You" ended, three minutes worth of confetti was shot into the air, and it began to snow inside like it was outside. In the end, there were over four hours of music played that night, but I went home feeling a little underwhelmed. 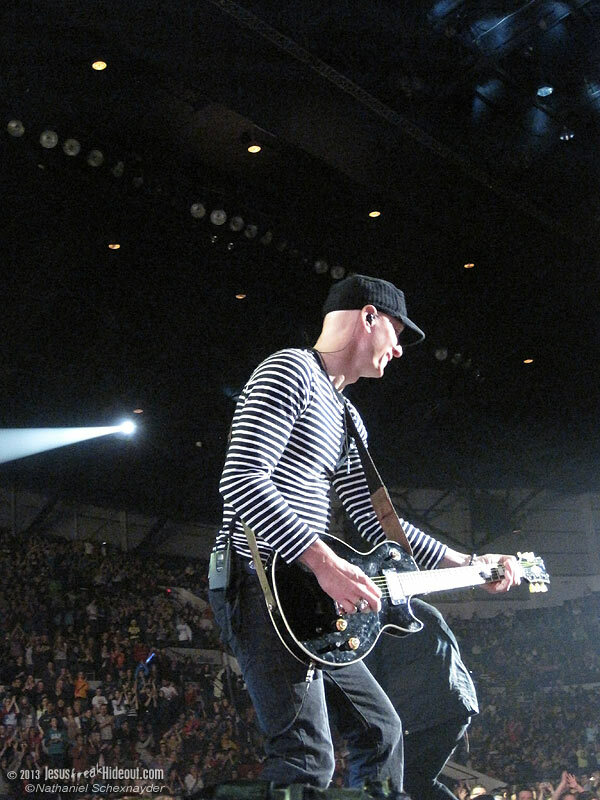 TobyMac put on a great show, but the Winter Jam 2013 had a very similar flavor to Winter Jam 2011. However, next month will mark my four year writing for JFH, and it's quite possible that I have lost some perspective since then. To get a different one, I asked my friend on the way home if she enjoyed the performance. She gave a very definite yes, and later she would say it was awesome. 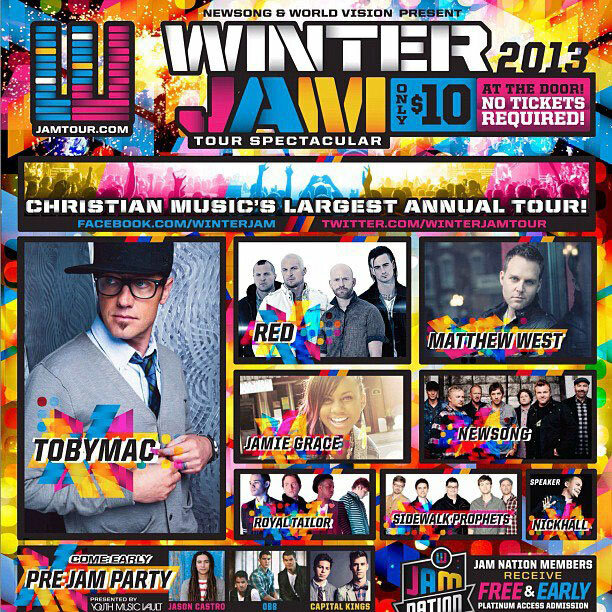 Well done, Winter Jam.